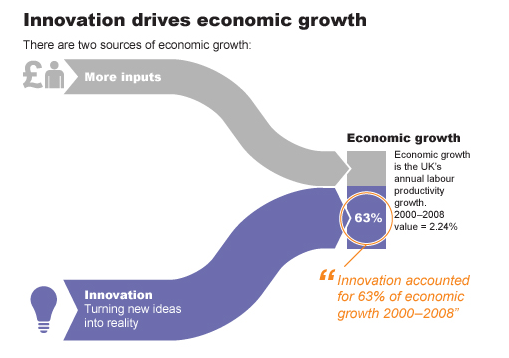 Part Two on the reality that innovation is presently stagnating in the UK, following on from my recent article Strike! Innovation is on strike. The whole understanding that if innovation stagnates so does the chance for recovery, for wealth creation and growth in jobs, and in our economic activity. If we are not ‘stretching’ for a better future, we are sitting back waiting for the right ‘fundamentals’ to return. They will not unless we decide to open up and reinvest in ‘things’ that have perhaps higher risk but contribute to changing today’s lack of dynamics. Nesta is the UK’s innovation foundation and they help people and organizations bring great ideas to life. I’ve been reading their different reports that focus primarily on the UK, but much of what they suggest can be applied to most of the developed nations in Europe and North America. The report can be viewed here, firstly through the Executive Summary and those interested in downloading the full report from their site. Nesta argue for Plan I as the ‘missing part’ for the UK to thrive as a productive, dynamic economy. The report lays out in significant detail the areas of potential focus and why and what they can be achieved to reverse this set of trends on innovation investment and regain economic growth within the UK. Countries as diverse as Korea and Finland, Israel and Singapore have sustained a mood of optimism and possibility through the crisis, and given business a sense of the future gains that make investment today worthwhile. Sadly a growing reality or a self-preservation attitude still prevails in the UK. But if we want to take advantage of the opportunities on offer in the next decade from new technologies, new markets, and new ways of doing things, we have to face up to the gaps, the failings and the many ways in which institutions and markets aren’t well designed to make the most of new ideas. They stay stuck in the past. It is hard to calculate precisely the size of the gap, but some of the analysis that follows suggests that in the UK, they may be under–investing in innovation to the tune of £38 billion a year. Transformation from industrial decay shows that change for the better can happen relatively quickly where there is the will. Currently we leave to many as “walking dead” and badly under support those in finance and resources required that show the way forward to ‘regenerate’. A policy design that involves arranging fundamental elements according to a few overarching rules or ‘design principles’, and then they, Nesta, suggest we all furiously set about adapting and improving them in the light of experience. Keep it simple, effective but well focused. Experimentation. Innovation is a risky business. Breakthroughs only come from a willingness to push at boundaries, to take risks, and, sometimes, to fail. What matters is not backing winning projects every time, but backing a good portfolio of projects. Experimentation is not easy, especially in an adversarial political system that is often very risk adverse due in large part to this inherent nature. Risks need to be taken in the face of huge challenges like ageing or climate change, as well as in making the most of great new opportunities like the Internet of things or synthetic biology. Entrepreneurship. Entrepreneurs are essential to an innovative economy: they don’t usually come up with ideas, but they do work out how to put ideas into practice. Entrepreneurship is also important to good innovation policy-making. The flip–side of an experimental innovation policy is the need for entrepreneurial leadership and challenge within the system. Entrepreneurial leadership within the system can be valuable. These kinds of entrepreneurial figures provide a valuable antidote to consensual policy that works primarily with incumbents. Openness. Good innovation policy cannot be made by government alone and certainly cannot be delivered solely through state bodies. Innovation flourishes when businesses, research organizations, and intermediaries such as standards bodies and trade bodies come together to identify and address major challenges. What is important though is government cannot rely simply on assembling interested groups – this risks capture by incumbents and vested interests, it needs a very open platforms where all can participate, working towards their goals but recognizing the essential need of all the diverse participates on the platforms. Ambition. Finally, innovation policy needs ambition, with the right mix of challenge and focus. Government’s power as a leader, as a customer and as a regulator matters as much as its narrow role as a supporter of research and development. Finland, Korea and Israel are all countries that have managed to make this a reality. In all cases, leadership has come from the top but been broadly based. Social innovations can offer great potential. The wastefulness, in both human and financial terms, of the way we run our healthcare systems, the way we care for old people, and the way we treat the most excluded in society, offers such potential to resolve through the appropriate innovation applications. It seems UK innovation policy lags behind that of Germany and Japan for example, both of which use grand challenges as a way of organizing and focusing innovative activity. I can only recommend you spend some time on the Nesta web site and value, as I certainly do, their focus on innovation in solutions, stimulating debates, conversations and in their well-structured reports. They are one of the best sources to go, for appreciating the complexity of innovation and being able to “see” where innovation lies, at the heart of all our futures. A powerful statement made by Nancy Koehn, professor at Harvard Business School at the Aspen Ideas Festival. I am tired of Government by numbers and process managers running so many of our public services – there is no common vision and no words to capture the hope and imagination of citizens – many feel more distant than ever from the wheels of decision making. Democracy is a great concept but it is about releasing the energies and ideas of people – not putting a cross on a voting slip. I don’t want to be represented. I want to stand tall, challenge the business as usual culture and get stuck into creating opportunities for people around me to shine. I don’t want to wait for due processes to stifle innovation. I think you are of a like-mind and I applaud NESTA.